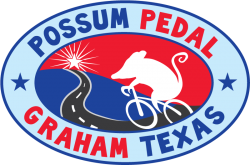 The Possum Pedal takes you back in time when life was a little slower and everyone greeted you with a smile. This year has all new routes of 6, 20, 37, 51, 67, and 83 miles, traveling Southwestern Young County, including Graham, South Bend, Eliasville, and Woodson. The terrain is rolling hills, smooth roads, and some of the most beautiful scenery in Texas. It is a great warm-up ride for The Hotter N Hell or a great way to just come out and enjoy a day away from the big city crowd.